I tried to think of a cute, funny little line for Ryan to be saying to me in this photo. But the thing is, this picture, from the hilarious and poignant movie Crazy Stupid Love, just makes me think back to the ancient past. Back when everything was different. BC. Oh, if only you could have known me, back in the day. When I used to spend time picking out an outfit (instead of just grabbing a t-shirt off the dresser) and then, with my girlfriends and while playing Big Audio Dynamite and Salt n Pepa, fixing my hair to be the perfect combination of curly yet smooth, and applying a fresh layer of eyeliner and mascara. Making a great effort to look effortlessly attractive and going out on the town. It seems like a lifetime ago, like it was a different person. It went from being completely, 100% all about me - what I was doing, where I was going, how I was feeling, and what I wanted to be doing next, to almost never about me. Today, my day to day, hour to hour existence is not much about what I want to be doing. And that's how I want it. I had 32 years of focusing on me. I was ready to make someone - someones - else be #1, and give up my throne. I was a little sick of me, and I wanted to raise children. There are still good times to be had, with a family. I find, though, after 10 years of parenthood, that I miss me. I miss spending time making myself look and feel good. I miss the carefree attitude. That's something I don't think you can ever get back, after having kids. You can go out and socialize and have a great time, but the kids are always there in the back of your mind. I don't think I realized that, when I was getting ready to have our first baby. How much you never, ever really leave them behind, even when you get a sitter and go out without them. This picture reminds me of me, 20 or so years ago. Not that I ever went anywhere as swanky as this, and not that Ryan Gosling was ever waiting for me at the bar. But a girl can fantasize, right? 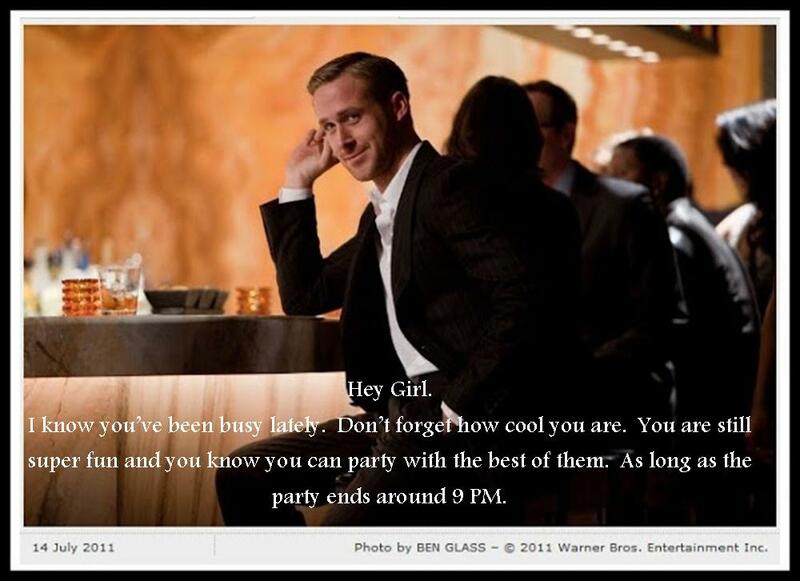 Thanks to Sunday at Adventures in Extreme Parenthood for reviving the Special Needs Ryan Gosling meme! Check out the other entries!